Campari and Aperol are an acquired taste. I’m sure you know a few people who won’t touch the stuff and some that swear by it. I fall into the latter category. I appreciate their sophisticated depth and find the bitter component they bring to cocktails absolutely essential. If it wasn’t for Campari we wouldn’t have the time-tested Negroni or Americano. Both Aperol and Campari are Italian aperitivos produced by the Campari Group. Campari was created in 1860 by Gaspare Campari. Aperol was originally created by Luigi and Silvio Barbieri in 1919. They are both characterized as bitters, an alcoholic beverage that is flavored with bitter herbal essences. You will often find them in cocktail recipes tasked with the role of balancing the sweet notes of a recipe, much like their close cousin the amaro. You’ve probably noticed conversations regarding the use of Aperol vs Campari in cocktail recipes. That’s because they have a lot of similarities, but I feel they are worlds apart. Aperol has a strong orange and mandarin orange flavor with a nice balance between a cinchona and gentian bitterness and an easy sugary sweetness. Campari kicks in with a bold woody bitterness, featuring more of a rhubarb and berry mid palette and finishes with a floral bouquet of potent herbs. There are a couple things to consider when deciding whether to use Campari or Aperol in a recipe. 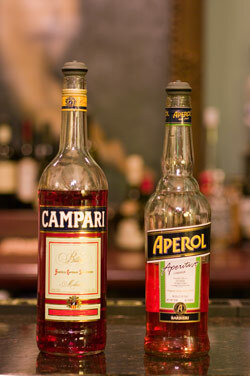 First, Campari has a considerably bolder flavor, while Aperol has a higher sugar conent. If you prefer cocktails that are bitter then Campari will be your choice. It is harder to balance and needs an equal part sweetening agent like a sweet vermouth. On the other hand, since Aperol is smoother, it is also more versatile. Third, Campari hass nearly double the alcohol content of Aperol. Aperol lends itself well to a milder, more refreshing summer drink. Campari is often in boozier drinks that pack a punch. Aperol and Campari will run you around $25 a bottle. Here are two Post Prohibition original recipes that feature Campari and Aperol. Add all ingredients in a mixing glass except the orange twist. Dry shake the ingredients to incorporate the egg, I like to use a hand held frother. Add ice and shake. Strain into a chilled cocktail glass and garnish with the orange twist or blood orange wedge. Muddle 1 rosemary sprig lightly in a mixing glass. Add all ingredients except the other rosemary sprig and the grapefruit twist. Shake with ice. Double strain into an old fashioned glass on the rocks, or even better one giant ice cube. 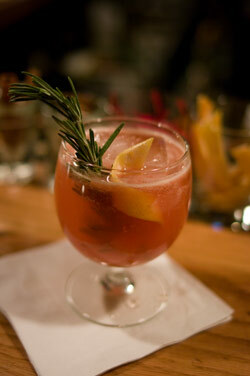 Garnish with a rosemary sprig and grapefruit twist. I was surprised to discover that I could be vehemently Anti-Campari and yet still Team-Aperol, especially since I’m the kind of girl who likes her whiskey neat, her wine dry, and her cocktails barely sweetened. To me, these bittered liqueurs each offer a very distinct and complex range of tastes that it would be a shame to miss out on, so if at first you don’t care for one, it’s well worth giving the other a chance. Good point. How do you feel about Amari? I have never even heard of it. Will have to keep an eye out. Molly, take a look at my amaro (amari for plural) post: http://​postprohibition​.com/​l​i​q​u​o​r​-​c​a​b​i​n​e​t​/​a​m​a​r​o​/​#​a​c​c​ess They are bitter Italian aperitivos like Campari and Aperol, very similar. There are a lot of brands out there and they all have distinct flavors. Since you prefer the more mild Aperol over Campari, maybe test out a bottle of Amaro Nonino. Interesting post. I agree they are very different yet similar, i like them both, but i put campari first, its my first love. The cocktails looks very tasty, both in recipe and pictures, especially the Sneaky Pete. Thanks. I put up a poll on my facebook: Aperol or Campari. Campari is winning so far. You’re in the majority. wonderful info I adore campari snd never knew the color came from beetles..wonderful site, I browsed your tequila recipes..perfect for cinco de mayo!! Thanks for the kind words. No better time to bust out the tequila than Cinco de Mayo. Keep it fresh! Is Aperol something that you would serve on the rocks or neat? I like to drink amaro neat (Montenegro or Averna) and wondered if Aperol can go that way. If you like amaro neat I’m sure you’d also enjoy Aperol neat. Aperol is often served on the rocks with soda as well. And of course makes for an excellent ingredient in cocktails. I’ve actually never had Aperol, but I love a Negroni or two on a warm summer evening. Your compare-and-contrast has my tastebuds in an adventuresome mood. Also, I almost never have everything on hand for a just-discovered drinks recipe. As a regular Negroni imbiber I always make sure to have Campari and Noilly Prat Sweet on hand. I just happen to have some Buffalo Trace; it’s one of my new favorite Bourbons. Bulleit is another, older favorite and I think it might make an excellent substitute. Now I need to figure out how to Kentuckify a Caprese salad to serve it with! Michael-Bulleit would totally work in this cocktail. I have been using their Rye lately. A bottle of Aperol should get you creativity flowing, enjoy! Share your cocktail experiences. I had an amazing drink at The Study at Yale with both Campari and Aperol and I have no idea how to make it, but it was amazing. I was indecisive at the bar and the bartender asked me if I wanted sweet, sour or bitter and I responded bitter and he presented me with the best drink to flow through my lips. ever. I was wondering do you know how is Aperol produced? Which is the difference between a bitter and a vermouth in terms of production? Is Aperol wine based and infused with roots and plants? Or which kind of alcohol is it? Thanks! I absolutely love Campari! The Negroni is by far my favorite classic cocktail. But, I absolutely love Aperol as well. I have recently been using Aperol as a bittering ingredient in one of my most recent cocktail creations. I think both have distinct qualities to offer. Also, Amaro Nonino is something I have been using in my cocktails as well. Averna is another of my favorite amaros. Delicious on its own as well as in mixed drinks. 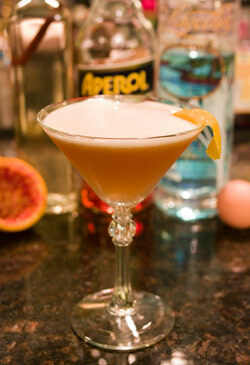 I use Averna for a play on a Whiskey Sour I have created. I just wish I had more guests that appreciated these flavors as much as I do. Keep up the good work, sir! Hi, We fell inlove with Aperol and drank it as a Spritz. Sadly, we dont have Aperol in Manila, Philippines. Any advice how to get it over here? Or maybe you can share a good recipe to use as a substitute for our Aperol Spritz? Thanks! What is the best way to store Aperol? Should I keep it in the refrigerator once opened or will it stay good at room temperature? I lived in Rome for two years in the mid sixties (!) and adore Aperol, which wasn’t available in the US at that time. LOVE the Italian bitter drinks! In rome, if you ask for an Aperol “alla romana,” you get it in a glass with ice and spritzer, and a lemon-rubbed rim, dipped in sugar. In other places, they don’t know what “alla romana” means. Where can I find Amaro Nonino? I’ve only had it at Fiorello’s in New York. You can find Amoro nonino at Binny’s they have it there as well as both Aperol and Campari. I like both Aperol and Campari but I think I like Aperol better in that it is much easier to mix and play with. The orange flavors make it great to add orange bitters to in a boulevardier and actually this Sneaky Pete is very similar to a Negroni and Boulevardier variation that I thought I made up! However if you don’t like sweet or nutty you probably wouldn’t like the Amaro nonino. It is rather sweet. Actually if you want that flavor (nutty) I would give black walnut bitters a go and use less Nonino. The cocktail I’m fixing for Thanksgiving is a version of the Paper Airplane. I’ve purchased Aperol over Campari as I tend to prefer lighter and sweeter with a hint of bitter. However, I’d rather not spend the additional $40–50 on a bottle of Amaro Nonino. Any suggestions? I’ve heard of Ramazzotti being used in this drink. Can I pair with Aperol? I fell in love with this drink a year ago at a party and remember it as equal parts sweet and bitter. I ordered it in a bar awhile back and didn’t care for it at all — too bitter. No idea what the ingredients in the original version I had were! Thanks! Try Amaro CioCiaro. A nice easy drink. It was invented in 1873, the recipe is a secret, but is based on bitter orange. It is dark brown in color, moderately sweet, and 60 proof.